A colleague of mine has an Aria Sinsonido silent bass guitar. For those who have never seen these things this is what they look like: http://www.ariauk.com/aria-as-691b-bass-guitar/ The pickup is a described as "Original Stereo Mic in Tube", and there is a volume and tone control. In this case the tone control does not work. A local guitar shop took a look, and passed it to their electronics person. He looked at it and concluded the circuit board was damaged, but was unable to source a replacement or repair it. It's a small circuit board with what look like two ICs, a bunch of caps and resistors, and the pots soldered directly onto the board. If I can figure out how to post a picture I've got a decent pic which shows the components. The forum doesn't host images so you'll need to host it somewhere else (imgur is currently a good bet) and then link to it here. Right, the reason I couldn't post the image is because the corporate firewall wouldn't allow upload to imgur. Should have guessed that since almost all upload sites are blocked. Unfortunately knowing how to post a pic is where my useful contributions cease. It ought to be worth contacting Aria to see if they would provide you with a circuit diagram, but even if they're not forthcoming, someone with a little more electronic experience could trace out the circuit diagram by viewing the other side of that circuit board - this circuit doesn't look too complicated. Even those two ICs have visible part numbers on them (well they would be visible under a magnifying glass ), so those could be replaced if they are the faulty parts. "Welcome to our Support page for your Aria guitar. Serial Numbers, Instrument Valuations, Wiring Diagrams"
And then tells you all the things that aren't covered under their limited lifetime warranty. <edit>. ps. With squinting at the photo (the guitar isn't to hand) and a bit of Googling, the chips are probably LM386 audio amps. If there is one per microphone, with the tone control varying the balance between the two then I can see how that would work. LM386's are power amps so they're unlikely to be used here. Someone experienced could almost certainly trace out the circuit diagram but my first instinct would be to find out what is hiding under that insulating tape - that looks a bit like a bodged repair. James Perrett wrote: LM386's are power amps so they're unlikely to be used here. It should be quite straightforward. I doubt those chips are anything special, but we'd definitely need to know exactly. We'd also need to see the underside of the board. There may be quite a bit of stuff under there. I would guess that to gain access, you take off the pot knobs, then undo the retaining nuts and the whole thing comes out. It's a pity the leads are soldered to the board and not plugged, otherwise I'd say send it to me! Look like 386's to me and the chip (not a proper 'op amp' BTW) is very suited to this task as it only draws 4mA and is pretty near bomb-proof. 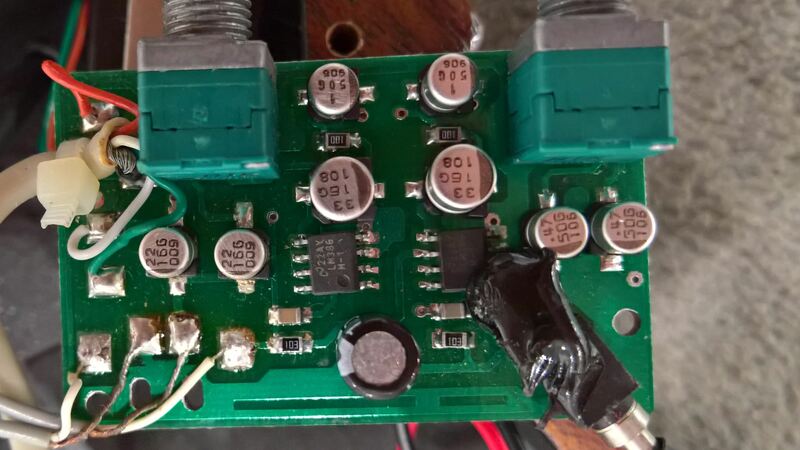 Yes the lekkie's tape looks naff but is only on the battery supply and since the board works the wires must be ok. Worth looking at though. You can prove both chips work pretty surely by measuring the output pin voltages, should be close to 4.5V for a 9V supply. As it is the tone that does not work I suspect an O/C pot track or an SMT component dropped off, maybe tother side of the PCB? The instrument is under my desk at work, so on Monday we'll see how easy it is to take the pots off and photograph the other side of the board. I'll take in a multimeter and measure the voltages as well. Have a great weekend everyone, and thanks again. Also, are we sure that this black stuff is insulating tape, and not a blob of some rubbery substance that's designed to hold that battery cable safely in place onto the circuit board? 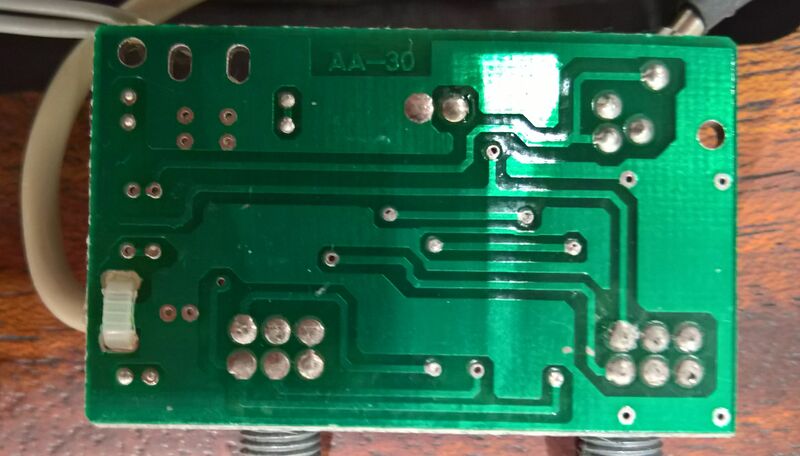 The PCB traces seem to back up the idea that it is an LM386 in inverting mode too. I missed the bit where the fault was mentioned on my first read through. 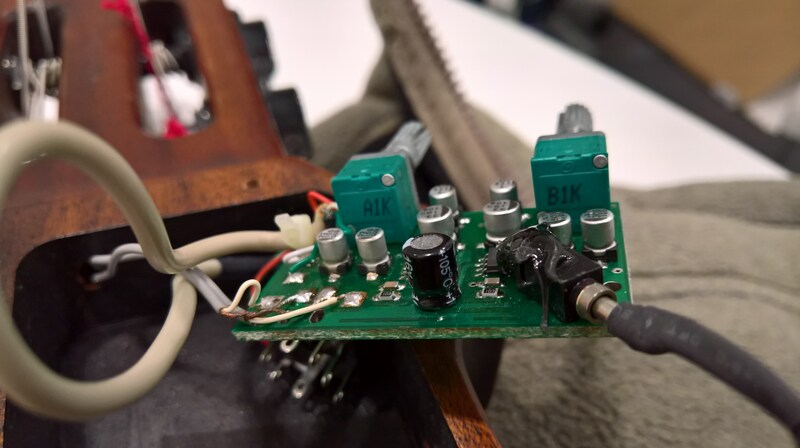 If the tone control isn't working could it be as simple as a dodgy joint on a capacitor? From memory the black stuff is rubbery gunk at the end of the power leads. Hope to post photos of the back of the board and more info tomorrow. Here are better photographs of the circuit board. Top, bottom and edge on. I've taken quite large photographs, so hopefully there is enough detail. The black stuff is an epoxy gunk, no obvious reason for it that I can see. Removing the board would be desoldering eight wires from the PCB and cutting the battery wires further up. Many thanks to everyone who has replied to this. My colleague's comment "What an amazing board - the forum not the circuit" says a lot. Is the pot on the right the tone control? James Perrett wrote: Is the pot on the right the tone control? According to the manual on the Aria worldwide archive http://ariaguitarsglobal.com/wp-content/uploads/Sinsonido-instructions.pdf the tone control is the one on the right looking at the pots end on from the outside, as James suggests. I'll have to actually plug it in tomorrow and check because I can't remember. 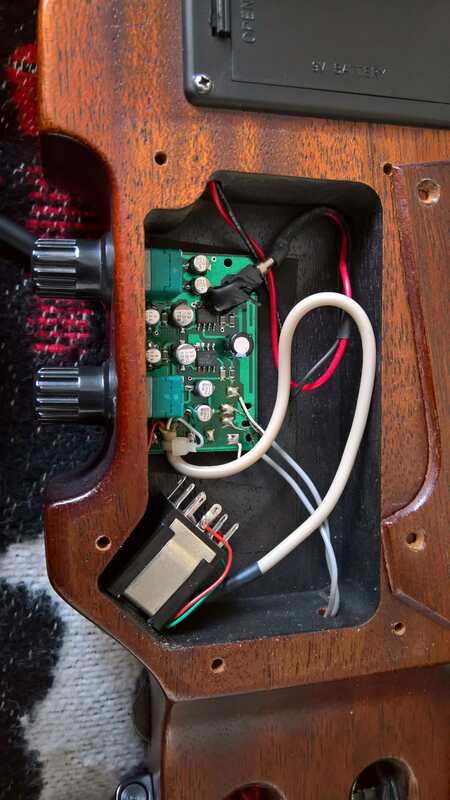 The volume pot is the one closest to the thicker white lead going to the output (marked A on the back), the tone control is the other one (B). Testing with the multimeter showed a voltage out Vout-GND of around 0.5-0.6V when the E string is plucked. Same for both chips, independent of the volume out position. Checked the pot values. Power disconnected. Which rather implies it's the pot that is knackered, unless there's something I'm missing? Is it a dual ganged pot and, if so, have you checked the other half (pins 2, 4 and 6?